This groundbreaking book dispels the myths perpetuated by some bestselling diet books that may help people lose weight, but will put them on the fast track to disease. Based on sound research and the success of thousands of people, The Schwarzbein Principle proves that excess weight, degenerative disease and accelerated aging can be controlled - and reversed - in a healthful way. 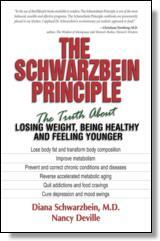 The Schwarzbein Principle is a holistic guide to achieving lasting weight loss, normalizing metabolism and maintaining ideal body composition through lifestyle and nutrition. By bringing the internal systems into balance, the Schwarzbein program has been proven to: reverse type II diabetes; free people from food cravings for chocolate, caffeine and sugar; cure depression and mood swings; and reduce body fat while building lean tissue. The nutritional program consists of two phases -Healing and Maintenance - which are easy to adopt into any lifestyle. Instead of shunning fat, the program advocates eating all of the good fats and proteins your body needs as well as an unlimited portion of non-starchy carbohydrates. By incorporating the lifestyle components of stress management, exercise and eliminating harmful stimulants, program participants experience renewed energy and vitality. In July 1990, I had just finished nine years of medical training at the University of Southern California. My training was in endocrinology and metabolism, and I was ready to go out and help the world. I accepted a position at a prestigious medical clinic in Santa Barbara, California. The clinic was famous for having been the premier diabetes center in the United States during the 1920s. I was excited about starting my new position, but I was not thrilled that all my new patients would be Type II diabetics. My area of expertise was "esoteric" endocrine diseasesùhypothyroidism, adrenal and pituitary problemsùconditions where the patient's symptoms could be reversed. I heard many stories of patients going for yearly physical exams and being diagnosed with diabetes incidentally. Chemistry panels had come back with a red flag of high blood sugarùdiabetes. These newly diagnosed diabetics were put on the American Diabetes Association (ADA) dietùa low-calorie, high-carbohydrate, low-fat, low-protein program. The diet stressed fruit, milk, bread and very little fat. It was very complicated. They had to measure everything they ateùproteins and fats, as well as carbohydrates. These patients had stuck to this diet, only to see their conditions worsen. I remember the sinking feeling as I told them, "I understand why you're upset about what has happened to you. But I would have asked you to follow the exact same regimen the other doctors have been prescribing. At this moment, I don't know what else to tell you, but I'm going to help you get better any way I can." I decided for the time being to get a baseline. "You're going to monitor your blood sugar seven times a day at home with a blood-sugar monitoring device," I instructed. "Before you eat, an hour after you eat and at bedtime. Write everything down. Everything you're feeling, everything you eat, activities, blood-sugar levels and any other observations. I'll see you again in a week." When they returned after monitoring their habits, my patients all told me, "It's the food I'm eating!" Something they were eating was causing the problem. It could not be the protein. Protein will eventually turn into sugar, but not that quickly. It could not be the fatùthey were eating hardly any fatùand fats do not turn into sugar that quickly either. Carbohydrates are the only nutrient group that can be converted into sugar so fast. All carbohydrates are recognized as sugar by the body, whether they are in the form of grains, starches, dairy, fruits or sweets. I suddenly recognized that by recommending a high-carbohydrate diet, we were giving sugar to diabetics. Requiring diabetics with high blood-sugar levels to follow a high-sugar diet did not make sense. But how could I challenge the ADA? I reasoned that the ADA diet must have been thoroughly researchedù they could not be recommending diets that were making people sicker! But all of my Type II diabetic patients returned with the same observations: The ADA diet was causing their blood sugars to rise to dangerous levels. Since foods are often a combination of fats, proteins and carbohydrates, if a food caused a rise in their blood sugars we classified it in the carbohydrate category. For example, most people think that milk is all protein, when in fact the amount of carbohydrates in four ounces of milk drives a diabetic's blood sugar up approximately one hundred points. With this method, the main ingredient of a food and whether it raised blood-sugar Levels dictated whether it should be considered a protein, a fat a non-starchy vegetable or a carbohydrate. Because I did not want my patients to go hungry, I added some protein and fats back to their diet. At the time, I still thought that a low-fat diet was healthier so I asked them to use Low-fat dairy products and to eat egg substitutes, mostly fish and chicken and small amounts of red meat. I also educated my patients about insulin levels. Eliminating obvious carbohydrates for one week would rapidly lower their insulin levels and they would have to reduce their diabetes medicines accordingly to avoid low blood-sugar reactions. One week later the first group of patients returned for an evaluation. I looked at the blood sugar numbers they had recorded. Their progress was astounding. I said, "This is unbelievable!" Some confessed, "Dr. Schwarzbein, I've been cheating. I love red meat and when you said I could have some, I ate it every night for a week. The "cheaters" were eating real mayonnaise, real cheese, real eggs and steak every day-foods that had been forbidden for so long they could not resist them. Their blood-sugar numbers had fallen dramatically. In fact the biggest improvements were seen in the patients who "cheated" the most. By cutting carbohydrates from their diets and adding proteins and fats, most patients (after an initial body-water loss) started losing one to two pounds of body fat per week. They ate fats and lost body fat. Ah came back to me and said, "I don't understand. I got fatter when I didn't eat fat. Now I'm eating fat and I'm losing weight. Prior to this, these patients had high blood sugars abnormal cholesterol panels, high blood pressure, weight gain, fatigue and constant hunger. As they followed the new dietary program their blood sugars normalized, so they were able to get off insulin and/or oral hypoglycemic agents (which treat high blood sugar). Their cholesterol levels improved, so I stopped their cholesterol-lowering medication. Their blood pressures came down, so I stopped their blood pressure medication. I was able to eliminate most of their drugs. They lost body fat and gained muscle mass. Their energy improved. They were not going hungry anymore. They felt great. My diabetic patients were so happy with the improvements in their health that they began to refer family members to me. Although these referred patients were not diabetic, they suffered from fatigue, excessive body fat with decreased muscle mass cholesterol problems, high blood pressure and even heart disease. I treated them with the same program. Body fat decreased and muscle mass increased, cholesterol levels normalized and blood pressures came down. They, too, felt great. Word of my successful "diet" spread. I started treating patients who had the same symptoms as the first two groups but no family history of diabetes. These patients all related histories of poor diets and chronic dieting, including low-fat dining. The program worked for them as well. I began to see people with isolated conditions: bad cholesterol profiles, high blood-pressure problems or excessive body fat. I put them on the program, altered by then to include more oils, real eggs, real butter I was amazed that the same program I used for my diabetics worked for all these people. Regardless of the patient's problem or illness, a balanced diet produced the same resultsùbetter health and decreased body fat. I felt I needed to gain a better understanding of these relationships. As I examined eating habits more closely I realized that, to reduce fat consumption as much as possible, many people cut down on proteins and ate more carbohydrates. Furthermore, since people had heard that complex carbohydrates are healthy and should form the bull of their dins, they consumed even more carbohydrates. Both medicine and the media had promoted the belief that eating a low-fat diet while increasing complex carbohydrates caused people to loss body fat and stay healthy. But I had yet to meet anyone who was healthy or thriving on a low-fat diet. Were the people who did well on low-fat diets so healthy that they had no need for doctors? I searched the medical literature, looking for studies showing that low-fat diets are healthy. I was surprised to learn that there are no long-term studies showing such results. But numerous studies concluded that fat is necessary to maintain good health. And there are studies spanning three decades relating high insulin levels and heart disease, high insulin level and hypertension, high insulin levels and excessive body-fat gain and other problems. I was taught that diabetic patients have a very high rate of heart disease. Correspondingly, I had observed that diabetic patients frequently had a large scar down the middle of their chests. Frequently I found that these patients had heart bypass surgery before they were diagnosed with diabetes. The implications suddenly occurred to me! After a heart attack people are told to go on a low-fat high-carbohydrate dietùwhich increases both their blood-sugar and insulin levels. The increases in blood sugar and insulin were turning heart patients into diabetics. The newly created diabetics are then told to continue eating a diet high in carbohydrates, which further elevates their blood-sugar and insulin level. Next, we say to those diabetics, "Your blood sugar is too high, so you need to take insulin to bring that blood-sugar level down." But insulin injections produce even higher insulin levels ù as well as increases in weight, blood pressure and the need far more insulin. Furthermore, the studies I read substantiated a connection between prolonged high insulin levels and the degenerative diseases of aging, such as osteoarthritis, different types of cancer, cholesterol abnormalities, coronary artery disease, ins lean body mass with excess body fat, high blood pressure, osteoporosis, stroke and Type II diabetes. For example, it is known that insulin directs all the biochemical processes that lead to plaque formation in arteries; therefore, I recognized that prolonged high insulin levels lead to heart disease. It is aim well known that prolonged high insulin levels could Lad to insulin resistance; therefore, I also recognized that prolonged high insulin levels could also lead to Type II diabetes. These studies corroborated my clinical experience showing that elevated insulin is linked to disease. Unfortunately, medical studies had not pinpointed the causes of prolonged high insulin levels that led to insulin resistance. The connection between elevated insulin levels, heart disuse and diabetes was assumed to be genetic. But I looked at it from a different angle. Since insulin resistance is connected to degenerative diseases, and since insulin resistance occurs naturally in the aging process, degenerative diseases of aging have to be linked to the aging process. Because the degenerative diseases of aging were occurring in younger and younger individuals, I began to consider the possibility that degenerative diseases of aging were not genetic but acquired. By ôacquiredö I mean that people were accelerating their aging process through poor eating and lifestyle habits that raised insulin levels. Furthermore medical science had gotten stuck on the assumption that only some people have the high-insulin gene. Again we differed. My clinical experience demonstrated that people acquired (not inherited) insulin resistanceùand that too many people were suffering from this condition. I became convinced that the degenerative diseases of aging (which are the end result of insulin resistance) are accelerated by poor eating and lifestyle habits. In other words, a genetic predisposition to disease is not a "guarantee" that you will develop that disease. Instead what you do and how you live your life determines your risk for developing insulin resistance and the degenerative diseases of words, in a perfect world where everyone ate a balanced diet of real foods and avoided stimulants and stress, there would be no appreciable difference between those people who secreted more insulin and those who did not. But this is not a perfect world poor eating and lifestyle habits have led to an imbalance of insulin levels; because the systems of the human body are interconnected, one imbalance creates another imbalance. This is beautifully illustrated by the current low-fat movement. Low-fat dieting upsets the balance within the human body by initially increasing insulin levels, in turn causing a cascade of hormone imbalances. The low-fat, high-carbohydrate movement promised long, healthy lives and trim, athletic bodies. Bur instead it caused prolonged high insulin levels, which in turn increased the number of people with heart disease, Type II diabetes, excessive weight gain and many more chronic conditions and diseases. Claim: Eating fat makes you fat. If you do not cat fat you cannot gain fat. Claim: Eating fat causes cancer Low-fat diets prevent cancer. Fact: Low-fat diets (high in carbohydrates) cause insulin levels to rise too highùa growth factor and a major player in cancer-cell replication. Dietary fat lowers insulin levels. Dietary fat is also essential for hormone production, which in turn is essential for a healthy immune system. In other words, dietary fat provides the immune system with key components that fight the growth of cancer cells. Fact: Cutting fat from your diet increases the risk of high blood pressure because, without fat, insulin levels rise higher in response to food. Insulin stimulates various biochemical processes that can lead V, increased blood pressure. It is important to note that these claims are not backed up by long term scientific studies. But the facts are supported by physiology and biochemistry (true science). By focusing on physiology and biochemistry, and the evidence of my own clinical experience, I learned how prolonged high insulin levels set off a multitude of chain reactions that disrupt all other hormones and biochemical reactions at the cellular level. I termed this chronic disruption "accelerated metabolic aging" and recognized that it led to body-fat gain, chronic conditions and degenerative diseases. Throughout the six-year period I have referred to above, I learned that there are other factors that raise insulin levels, both directly and indirectly, and that prolonged high insulin levels are caused not only by eating a low-fat, high-carbohydrate diet but also by stress, dining caffeine, alcohol, aspartame (an artificial sweetener), tobacco, steroids, stimulant and other recreational drugs, lack of exercise, excessive and/or unnecessary thyroid replacement therapy, and all over-the-counter and prescription drugs. These factors have become central in the eating and lifestyle habits that have prevailed over the last twenty years and that parallel the rise in the incidence of disease during this same period of time. My program gradually expanded to include balanced nutrition, stress management, exercise, the elimination of stimulants and other drugs, and hormone replacement therapyùa complete program designed to balance insulin and all other hormone levels. The Schwarzbein Principle was written to share this program with youùto tell the truth about losing weight, being healthy and feeling younger, by first focusing on this principle: Degenerative diseases are not genetic but acquired. Because the systems of the human body are interconnected and because one imbalance creates another imbalance, poor eating and lifestyle habits, not genetics are the cause of degenerative disease. I have seen what high-insulin eating and lifestyle habits do to people. People are getting fatter, sicker and more depressed. Indeed, it has not taken longùonly two decadesùto realize the repercussions of eliminating fat, one of the most important nutrient groups, from our diet and replacing real food with invented substances, processed foods and stimulants. Moreover, American society's preoccupation with numbersùwhether referring to chronological age, total cholesterol numbers or the number on the bathroom scalesù has wrought devastating results. Many popular books offer programs that require time-consuming computations and obsessive measuring and focus on food. But my experience with patients demonstrates that, ironically, the more a person obsesses about numbers the more likely he or she is to engage in harmful behaviors that generate chronic health problems and disease. One of my goals as a physician is to change our culture's fixation on meaningless numbers to an emphasis on qualify of life. When people are told that poor heath is genetic, they are more likely to tolerate illness and decreased quality of life as their lot. Along with this resignation comes increased body fat, depression and lethargy. Teaching people that heath and vitality are within their grasp, and showing them how to achieve optimum health, is the key to the success of my program. When people understand that they have control over their health, they are motivated to make significant changes in habits. All rights reserved. Reprinted with permission of Health Communications, Inc. from The Schwarzbein Principle, by Diana Schwarzbein, M.D. and Nancy Deville. No part of this publication may be reproduced, stored in a retrieval system or transmitted in any form or by any means, without the written permission of the publisher. Publisher: Health Communications, Inc., 3201 SW 15th Street, Deerfield Beach, FL 33442.